We were in San Francisco for a weekend earlier this year, and I had a couple of chances to photograph the sunset and sunrise. 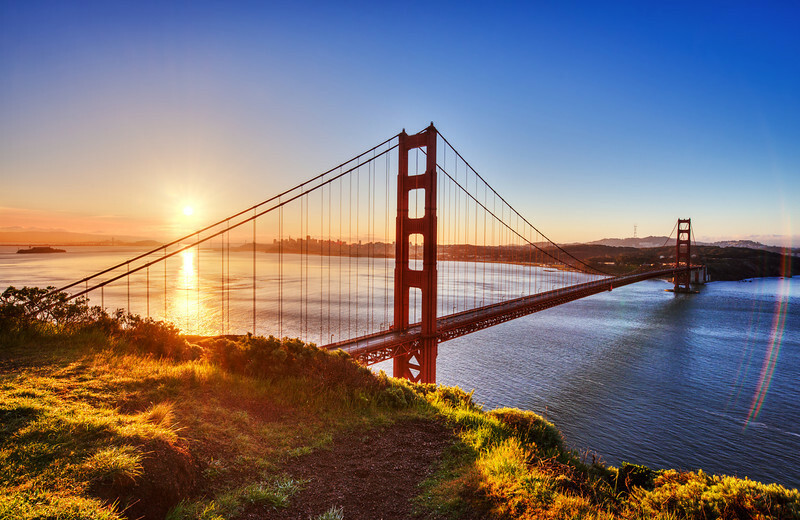 I knew I wanted to try both from the Marin Headlands, which is great vista in the Golden Gate National Recreation Area for viewing San Francisco from the other side of the Golden Gate Bridge. Unfortunately, the first afternoon on our way there, we decided that we “needed” some In-N-Out Burger. Unfortunately, navigating downtown San Francisco around 5 pm on a Friday afternoon isn’t quite so easy, and I didn’t end up making it to the Marin Headlands until post-sundown. The next morning, we made sure to get up plenty early to get to the Headlands before sunrise. Traffic was much better this time, and we made it from our hotel to the Headlands in about the same amount of time it took us to go about 1/20th that distance the previous night! We managed to hit the Headlands and then Muir Woods all before noon, and then make it back for some more In-N-Out Burger. The moral of the story, if there is one, is that In-N-Out Burger is delicious…or something like that…and this bridge is really photogenic. Photographed with a Nikon D600 and the Nikon 14-24mm f/2.8 Lens. I switched up my lenses numerous times during the sunrise, using an ultra-wide angle, mid-range zoom, and a telephoto to get compression shots of the Golden Gate Bridge, Alcatraz, and the Bay Bridge. The editing here might seem fairly pedestrian, but there is a bit to this one. I liked this post sunrise shot because it had more blue in the sky than my actual sunrise shots and seemed to have a little more depth thanks to the flare and look of the water. However, the sun was really bright, and shooting directly into it meant that a lot of the scene was blown out. This is something I find very difficult to fix in a natural looking manner. The best bet is usually double-processing (as a Smart Object in Photoshop) a single raw file, but that didn’t work so well here. Instead, I processed a bracketed series of 3 photos in Photomatix, I rarely process photos with Photomatix, but when I do, it’s basically always the same way, clicking on a couple of presets I’ve made and doing minor adjustments from there. After I was finished processing in Photomatix, I had a photo that looked a bit over the top. Problematically, it also had highlights that were tamed far too much to look realistic. To fix this, I brought the image into Photoshop, and I processed the ‘0’ exposure from the bracketed set in Adobe Camera Raw. I then layered the 0 exposure on top of the HDR photo, and adjusted the opacity of the edited 0 exposure until I had something that looked more realistic (it was about 75% 0 exposure at that point). This way, the highlights weren’t tamed too much, but they weren’t blown to a ridiculous extent. I finished the shot by applying a couple of adjustment layers, mostly to tinker with the blacks, contrast, and colors. As far as the photo goes, I realize the sun and the water below it are blown out. These are aspects of the shot that I could have kept “in check,” but I decided against this because I thought it looked too processed and fake that way. I think if you looked at this scene in real life with your eyes, the light would be this bright. While my shots sometimes cross the line into hyper-realistic territory, I generally try to keep them somewhat realistic (unless I’m trying something different), so I thought having the water and sun blown would work just fine. Hopefully they do! What do you think of the blown areas of this photo? Would you pass up a sunrise for some In-N-Out Burger? Share any thoughts you have in the comments! I just saw your photo on a friends Facebook wall. It’s being posted by The US Department Of The Interior. Just FYI. Credit for the photo is being given to Bruce Getty. Can I post this picture on @California is I give you photo credit? It’s amazing! Yes, just please give credit. Thanks for the tip! I actually *did* check out the Mandarin Oriental, but only for the view. Unfortunately, during our stay the hotel was around $500/night, so it was a bit out of my price range. Maybe next time! Not much to comment about the photo, but I had In-N-Out Burger for the first time in my line ~6 weeks ago after hearing it taled up by west-coasters. For the price, it’s a really tasty burger. But I found it to sit like a lump in my stomach after the fact. (Eating before driving down Mulholand drive probably didn’t help.) So I probably wouldn’t skip anything important for it. This is really excellent. I like your processing, exposure and decision to not over do the HDR. I kind of like photos that make you squint. The only thing, if it were my photo, would be to play with the crop. I’d feel like there might be a better crop and play with it. You’d lose the wonderful lens flare though. I’m probably wrong, but if I had anything to say, that would be it.Really excellent work though. I know what you mean about the crop. I toyed with it a bit, but ultimately couldn’t come up with anything I really liked. Ideally, the near side of the bridge would be in the left third, and the far side would be in the right third…instead, the near side is sort of in the middle. The lens flare isn’t really THAT special, but I just can’t really see any better options here. I think with crops, especially, it’s great to get feedback from others because something that I might be fixating on that *needs* to be there (in this case, Alcatraz or the flare) really aren’t that important to anyone else, and cropped out might make for a better photo. I’ll have to open up the raw file again and see what can be done…I might just have to go with another photo that has a different composition. Thanks!